This article was reposted with the consent of the World Socialist Web Site. The original article can be viewed here. The Mexican and US ruling classes have sought to claw back concessions and contain and isolate the rebellion by laying off 4,700 workers to date. The ruling class has also threatened to fire 50,000 of the 85,000 maquiladora workers in the city and is desperately propping up the trade union apparatus to block further struggles. It is accelerating its attacks against democratic rights and is turning toward authoritarian and militaristic forms of rule. On March 1, a Matamoros worker shared a World Socialist Web Site article online regarding the crippling effects strikes are having on the North American auto industry and the growing support for Mexican workers across the continent. The worker posted: “Wow, finally I read something coherent about workers and their movement.” As it began to circulate widely on Facebook, 52-year-old labor lawyer Susana Prieto Terrazas intervened to denounce the WSWS. What she calls “pathetic”—workers’ independent initiative of self-organization—is precisely the source of the workers’ power. Workers in Matamoros took the historic and crucial step of forming rank-and-file committees to by-pass the trade unions so that they could communicate democratically, appeal not to the Mexican government, but to workers across the city and internationally and organize the largest strike across North America in at least three decades. Consolidating these gains and taking the struggle forward under an internationalist and socialist program is the only way forward against mass reprisals. For all Prieto’s “left” talk, the truth is that she is a longtime partner of the US trade-union federation, the AFL-CIO, which makes Mexican company unions or charrismo look almost like militants. A self-proclaimed “capitalist,” Prieto arrived at Matamoros dishonestly denying her ties to any unions and to the ruling bourgeois party Movement for National Regeneration (Morena) in order to politically disarm workers and find the best way to shut the strike down. She offered the legal “advice” that workers had to remain tied to the union apparatus and place their trust in Mexican President Andrés Manuel López Obrador (known as AMLO) to “win” their demands. She convinced workers to send delegations— on March 5 to Monterrey, León, and on March 13-15 to Mexico City—to discuss joining “independent” unions bound to the Morena government and US and European imperialism. It is critical to refute Prieto’s slanders against the WSWS because they lie at the center of this political fraud against the working class, which must now draw the lessons from the strike and render accounts of the roles played by its protagonists. This requires a sober examination of how this strategic experience unfolded within its historical and international context. What produced the wildcat strikes and why in Matamoros? During the 1980s, new shipping and information technologies set the stage for the globalization of capitalist production. One of its effects was to render unviable the isolated Soviet economy, fast-tracking the dissolution of the first workers state, the USSR, at the hands of the Stalinist bureaucracy. The closer integration of production globally and the demise of the USSR only deepened the crisis of the capitalist system. Japanese and European imperialism had partially recovered since World War II to become again contending rivals of US imperialism. Renewed global competition for sources of cheap labor, markets and natural resources—intensified by the computerization of trade and financial capital—was accompanied by the formation of rival trade blocs. Industrial centers sprung up across the US-Mexico border and in the Bajío region in North-Central Mexico, raising the workforce at maquiladora sweatshops from 400,000 to 3 million today, with millions more employed in related activities. Despite the ballooning demand for Mexican labor, living standards fell. A study by the Economics Faculty in UNAM titled “Mexico 2018: another social and political defeat for the working class” found that the real purchasing power of Mexicans has fallen 80 percent in the last 30 years, indicating that more than 24 hours of work today are necessary to afford the staples one bought in 1987 with roughly five hours of work. “Today, industrial salaries in Mexico are 50 percent of industrial salaries in China. The relation was the opposite two decades ago,” reported the bank HSBC last year. Seeing their wealth and power increase with the inflow of foreign capital, the Mexican bourgeoisie and trade unions forged tighter relations with US imperialism and readily enforced the falling compensation for Mexican workers’ labor to meet the globalized profit requirements of the financial elite. In Matamoros, strikes during the 1980s had won maquiladora workers unique conditions in the region, like a 40-hour week paid at 56 hours in 1983, along with a relatively more militant tradition. Facing such pressure from below, Agapito González Cavazos, after four decades leading the Union of Laborers and Industrial Workers of the Maquiladora Industry (SJOIIM), was one of the few trade union leaders still calling strikes to resist the downward pressures of the approaching NAFTA agreement. On January 31, 1992, however, during negotiations with 42 companies, including General Motors, González was detained for several weeks by federal authorities on charges of fiscal fraud. Under González, the union had consolidated its significant wealth, financial obscurity, prominence in the CTM and ruling circles and its corporatist role as a labor contractor subordinated to management. [Williams, Edward J. and Passé-Smith, John T., 1992. “The Unionization of the Maquiladora Industry: The Tamaulipan Case in National Context.” San Diego State University] The arrest was for González the sign that it was impossible to continue juggling any defense of workers’ interests and the union bureaucracy’s comfortable social standing, which rested on the defense of capitalist relations and their nationalist framework. Along with every trade union in the world, the SJOIIM responded to the new context under globalization by dropping any serious resistance until Gonzalez’s death in 2001 and thereafter. The 48-hour week was re-imposed and, according to a recent article by SomosMass99, the starting salary being negotiated in 1992 by the SJOIIM was the equivalent of $19.50 per day, compared to the current $10.86 including the recent 20 percent raise. By the end of 2018, the percentage of the working population with an income below the basket of staple foods, which the government defines as extreme poverty, was 40 percent. Meanwhile, the top 10 percent has hoarded 67 percent of the country’s wealth and more than 80 percent of financial assets. The number of dollar millionaires increased 27 percent to 88,000 just in 2017, when officials reported that 57 percent of the working population had no access to social security benefits, including health care. The pressure to transfer ever greater amounts of money into the financial markets only intensified after the 2008 crash, at a time when China became a new economic competitor on the world stage. Facing a continued decline of its relative economic power, US imperialism has been compelled to consolidate its own economic, political and military sphere of control in preparation for economic and military confrontations against its global rivals. These strategic considerations were behind Trump’s renegotiation of NAFTA, which includes several concessions from the Mexican and Canadian bourgeoisies in favor of US capital, including a ban on forging a free trade agreement with China. Fundamentally, Trump’s protectionism relies on further downward pressures on wages and conditions to incentivize the reshuffling of production from China, Europe and Asia back to North America and, on a lesser degree, to the rest of US imperialism’s backyard, Latin America. The US Commerce Department recently listed imports for US auto manufacturers, and presumably other key industries, as a “national security” concern. The new NAFTA requires that 75 percent of components of cars and trucks be manufactured within North America, an increase from 62.5 percent. Already 45 percent of auto parts imported into the US come from Mexico, while 40 percent of Mexican-made vehicles exported to the US consist of auto-parts made in the US. “The US and Mexico auto industries are like Siamese twins, inseparable and highly intertwined,” writes the industry magazine Mexico Now. Eighty percent of Mexican exports, mostly industrial products made in maquiladora plants, go to the US. Cheap labor, tax cuts, land and other incentives for investments in the Mexican maquiladora industry lie at the heart of US capitalism’s strategy for trade war and military confrontation with its global rivals. Representing the interests of rent-seekers or junior partners to US and foreign capital within the Mexican ruling elite and upper-middle class, including factions of the trade-union bureaucracy, the AMLO administration came up with a scheme to further cheapen labor and cut taxes to attract US investments, particularly after the Trump administration had brought down the corporate tax rate from 34 to 21 percent. At the same time, the overwhelming majorities won by Morena during the July 2018 presidential and parliamentary elections reflected profound, popular aspirations that this party, touted as “left,” would implement policies to massively improve social conditions for the toiling masses. These considerations led to a signature campaign promise of AMLO: turning the 18-mile-wide strip along the 2000-mile border with the US into a free trade zone. The plan, which took effect January 1, cut the value-added tax from 16 to 8 percent and the income taxes from 30 to 20 percent in the new free trade zone. It also raised the minimum wage 16 percent nationally to a meager 102 daily pesos ($5) and 100 percent within the free trade zone to 176 daily pesos ($9.15). The majority of workers along the border already earned slightly more than 176 pesos. In Matamoros, only 20 percent earned less, according to the maquiladora association Index. The crux of AMLO’s free trade zone was that companies would be free to eliminate bonuses to “compensate” for the new minimum wage, even if workers were not benefitted by the raise. While AMLO and Morena were taking workers for fools, as early as November 13, there were reports of workers at border cities denouncing the elimination of their bonuses. In Matamoros, the situation was even more explosive. An old provision in the SJOIIM contract stipulated that salaries across the board must increase proportionately to any minimum-wage hike to protect purchasing power, and that bonuses had to compensate workers for this change. Throughout December, the union leader, Juan Villafuerte Morales, and the union delegates from the 48 plants—a majority of which are owned by US-based companies—held backroom talks with the local government under the new Morena mayor, Mario López (nicknamed “La borrega” or “the sheep”). During these negotiations, Mayor López told reporters from Central TV that the wage increase was “not financially viable for the maquiladoras” so he was “intervening” in a “chat” between the union and the companies. Instead of paying the 100 percent wage increase and the corresponding bonus of 32,000 pesos, it turned out that the plan of the SJOIIM, Morena and Index was to silently overlook the raise and bonus, even the standard annual bonus of 3,000 pesos. On December 28, a short wildcat strike of hundreds of workers at the maquiladora of Seisa Medical in Ciudad Juárez against the halving of their bonus was a shot across the bow. With a social explosion brewing, Susana Prieto returned from a vacation in Patagonia and, as early as January 5, intervened with a video message to AMLO, claiming she was receiving complaints from workers in the border region and channeling this opposition behind an appeal to the new government to ban the sweeping cuts to bonuses. Prieto—whose office is in Ciudad Juárez and who resides across the border in El Paso, Texas—gained local prominence in 2015-2016 while representing 56 workers fired from a Lexmark maquiladora for protesting for a switch to an “independent” union to fight for better conditions. In 2016, protests against the unions, poverty wages and sweatshop conditions soon grew into mass marches of thousands of workers from Eaton, Lear, Foxconn, Lexmark and other plants. Prieto quickly founded an advocacy organization named Obrer@s Maquiler@s de Ciudad Juarez A.C. [Maquiladora workers of Ciudad Juárez]. While claiming a leading role, it served to prevent wildcat strikes, isolate workers in Ciudad Juárez and channel them into a dead end: formal complaints to the corrupt Labor Conciliation and Arbitration board, loans, unsuccessful demands to switch to one of the self-proclaimed “independent” unions, and an unsuccessful non-party bid for mayor by one of the workers, Antonia Hinojosa Hernández. Her organization and representation of the 56 workers was openly backed in March 2016 by the main trade-union federation in the United States, the AFL-CIO, along with the Mexican New Workers Central (NCT), IndustriAll and several other local and international organizations. A letter from the AFL-CIO called on Lexmark to “recognize publicly the rights of workers to form an independent union,” and was signed by the director of the US federation’s International Department, Catherine Feingold, who rose up the ranks of the federation’s CIA-sponsored Solidarity Center. Prieto’s Obrer@s Maquiler@s de Ciudad Juarez A.C. then organized a march across the border on April 24-26 with the Alliance of National, State and Municipal Organizations of the Movement of San Quintín Workers, itself co-founded by the AFL-CIO during a similar rank-and-file rebellion against the existing union in 2015 by agricultural workers in Baja California. 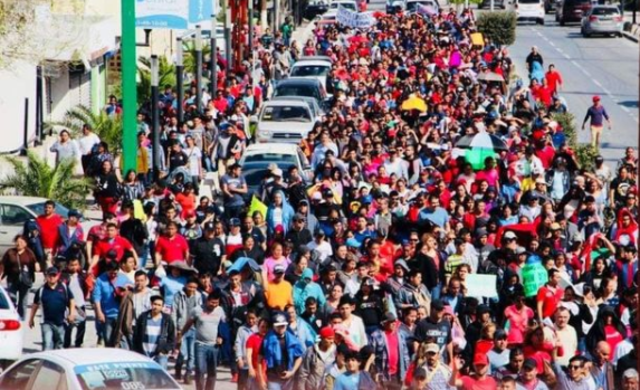 The “most important victory,” according to an Alliance statement, was the founding of the Independent, National and Democratic Union of Workers of San Quintín (SINDJA), which immediately affiliated to the National Workers Union (UNT). The march co-organized by Prieto would culminate in another Binational Conference in Ciudad Juárez on April 27-28, 2018. Then, on January 7, 2019, Prieto announced the beginning of “the fight in defense of salaries in this country” in a video in which she expressed concerns about growing opposition to AMLO and gave thanks to Morena congresswoman Letty Ochoa Martínez for sharing her videos with the president of Morena, Yeidckol Polevnksy. Finally, she called for a demonstration in Ciudad Juárez for January 19.